Venus is an "evening star" in February 2015. Look for it in the southwestern sky just after sunset. Planets will be on parade in February's night sky. Giant Jupiter will dazzle all night long for the entire month, as the planet is now is at opposition to the sun. And if you're awake in the early morning hours, look for the ringed wonder, beautiful Saturn. Skywatchers will also have good opportunuties to see Mercury, Venus and Mars this month. Feb. 6: Jupiter reaches opposition on this date, meaning it's opposite to the sun in our sky. Therefore, Jupiter rises around the time the sun sets, shines highest about midnight and sets around sunrise. Opposition is also when Jupiter is closest to Earth for the year, appearing biggest and brightest. Look for it in the east as the blue sky darkens. When you face Jupiter, Venus is almost directly behind you. How impressive is Jupiter this month? The giant world burns at magnitude minus 2.6, three times as bright as Sirius, the brightest star, which sparkles very far to Jupiter’s right or lower right on February evenings. Feb. 13: Around 4 a.m. local time, you'll see a fat crescent moon well up in the southeast sky, and about 5 degrees to its upper right you’ll find Saturn, the best morning planet. Note the first-magnitude reddish star Antares, about 9 degrees below Saturn. During this month, Saturn slowly edges past the head of Scorpius, a "fence" of second- and third- magnitude stars. A telescope shows that by month’s end the north face of Saturn’s rings is tilted 25 degrees toward Earth, enough to reveal the outermost ring’s entire edge. The rings won’t be inclined so much again until mid-October, when Saturn will be less favorably placed. Feb. 17: Here is a challenging observation that you might want to attempt if you're an early riser. Using binoculars about 40 minutes before sunrise, scan low above the east-southeast horizon for the slender sliver of a crescent moon, which is only 3 percent illuminated by the sun. If you’re successful, look about 5 degrees to the right of the moon for Mercury. 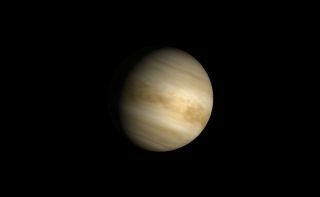 Read the Feb. 24 entry for more observing details for this planet. Feb. 20: Check out the west-southwest sky as darkness descends this evening. You'll see a lovely crescent moon looking like a thin smile on the sky. Just off to its left is Venus, and just above it will be a much dimmer Mars, glowing with a yellow-orange tint. At magnitude plus 1.3, Mars still ranks among the 21 brightest stars in the night sky, but shines only 0.8 percent as brightly as Venus. Two nights from now the moon will have moved on, but the two planets will be closest together, separated by only 0.4 degrees. Feb. 24: Mercury was at inferior conjunction with the sun on Jan. 30, but since that date this fast-moving world has leaped up on this day to attain its greatest morning elongation. Unfortunately, Mercury's 27-degree separation from the sun lies at a shallow angle to the eastern horizon for skywatchers observing in northern temperate latitudes. They will find the planet mired low in the dawn, where it may be barely glimpsed. It will appear just above the east-southeast horizon about 40 minutes before sunrise, from about Feb. 21 to Feb. 28. By contrast, Southern Hemisphere observers see a superb apparition of Mercury high in the dawn, where it continues to be seen into March. In short, the farther south you are, the longer you'll be able to keep track of this planet. Editor's note: If you snap an amazing skywatching photo of a planet or any other night sky view, and you'd like to share it for a possible story or image gallery, please contact managing editor Tariq Malik at spacephotos@space.com.